Sword fighting is a lost art. The days when chivalrous men drew sabers and danced about like modern day Parkour enthusiasts to settle disputes fell out of favor a couple of centuries ago. In some ways that’s a shame. Think of the wars that could have been avoided if politicians had drawn their epees and dueled until one touched another. Touché… now let’s just all go home, Prussia is yours sir. There are many examples of these types of lost arts throughout human history. Many of which would be useful today. Conversation is one. With the advent of all the internet connected smart devices in the world, we humans spend less time actually talking to one another. Instead we text, snap chat, tweet, and Facebook. We mine “likes” as if they were nuggets of gold, and communicate in a shortened language in order to fit into a single text or 140 characters. #WhosActuallyTalking? Lost arts exist in the automotive world as well. Many of us can remember a time before seat belts were required, air bags were people who talked too much and collision avoidance meant keeping your eyes on the road. Yes, these “lost arts” are better off lost, as cars are safer than ever these days. But in some ways we are losing our connection to the car and the road under the wheels we once had. Seatbelts and air bags save lives and collision avoidance helps to, well, avoid collisions, but at what cost? Knowing we have such things can allow is to relax our guard a bit behind the wheel. Gone are the days when dad kept his attention fully on the road because the kids were facing backwards in the rear of the station wagon with no seat belts. Now, even though it is illegal in many states, we can take a moment to check text messages or see how many likes our cat meme got because we are belted in, surrounded by exploding marshmallows and trusting radar to avoid crashing into the car in front of us at a stoplight. There are other lost automotive arts as well, specifically manual shifting. 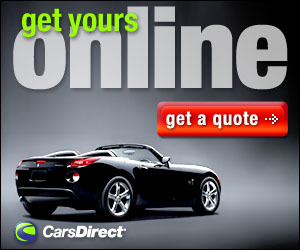 The automatic transmission found in almost every car does the work the driver once had to do. When a driver had to do the shifting, more attention was paid to the road ahead; you actually had to think about what it was you are doing, driving. Rare is the availability of a gear shift rising from the floor these days. In fact many drivers today, the late teens early-twenty’s children in our family included, have no idea how to drive something with a manual shifter. Sure manual transmissions are still available, but almost as an afterthought, an option. That is unless you buy a Ford Focus ST. That’s because this hot little hatchback isn’t even available with an automatic transmission, shift it yourself or go home. That, like this car, is a very good thing indeed. 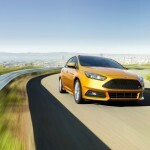 When told we would be getting the 2015 Ford Focus ST for a week we knew we would have fun. That’s because, this hottest of the hot hatches, is proceeded by a good reputation. 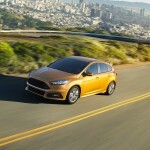 Since its introduction in 2012 Ford has tweaked and refreshed it. 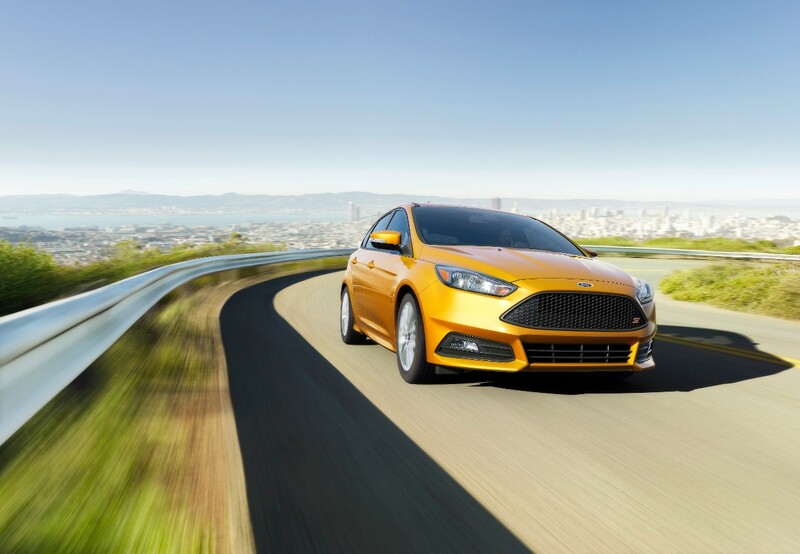 For 2015, the ST gets redesigned, sportier front and rear fascias, a redesigned instrument panel center stack and a new center console with more storage space including a new media bin with USB smart charging port, which charges two times faster than the previous USB port, and new exterior finishes. Along the center top of the dash there is an additional bank of three gauges situated in a central instrument pod that displays turbocharger boost pressure, oil temperature and oil pressure information. There is also a new flat-base sports steering wheel with a soft-feel leather covered rim. A rearview camera is now standard, and the options list grows to include amenities such as a heated steering wheel. 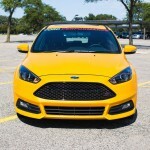 What Ford has ended up with is something the only slightly resembles its sedan cousin. In fact, the ST is like the whacked out cousin covered in tattoos that likes to go to the Electric Daisy Carnival every year. 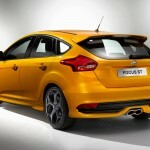 The new Focus ST is available in ST1, ST2 and ST3 trim levels. There are plenty of standard features; 18-inch alloy wheels, LED running lights, performance brakes, power accessories, keyless ignition and entry, air-conditioning, cruise control, the rearview camera, and the like. Moving up to the ST2 (which was our tester for the week) package adds xenon headlights, cornering lamps, Recaro front sport seats, dual-zone automatic climate control, the MyFord Touch interface with an 8-inch touchscreen display, and a 10-speaker Sony sound system with HD radio and satellite radio. The ST3 package adds heated mirrors, heated front Recaro seats, an eight-way power driver seat, more head restraint adjustment, full leather upholstery, a heated steering wheel, a rear center armrest, an overhead interior console, ambient interior lighting and a navigation system. Stand-alone options include a sunroof, a dark gray finish (with red-painted brake calipers) for the standard 18-inch wheels, and a set of black or red racing stripes that run the length of the car. We didn’t have the sunroof, but did have the black stripes on top of the Race Red exterior and the navigation system. 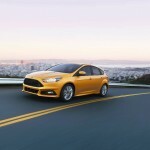 No matter which variant, under the hood of the ST is a turbocharged 2.0-liter inline four-cylinder EcoBoost engine that delivers 252 hp and 270 pound-feet of torque. 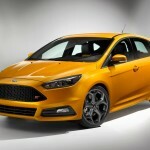 For 2015, Ford also retuned the ST’s suspension and steering to make the car feel even more reactive and agile to drive. Never having driven an ST prior we have nothing to compare it to, however we can attest to the fact that this is a fun car to drive. The six-speed manual transmission that includes hill-start assist is a performance-oriented, short-throw shifter. Combined, the engine and manual transmission deliver great performance on the road while returning decent fuel mileage (23 city, 32 highway). While some might complain about the Recaro sport seats, we have had those before and despite our rather portly frame, like the way the bolsters hold us in along with the overall support they provide. 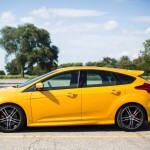 And having taken a road trip in a Ford Fiesta ST several years ago with the same seats we can attest to the fact that we were kept comfortable the entire time and during our most recent week with the Focus. The Focus ST is respectfully quick off the line, we did 0-60 in 5.1 seconds with a lag due to our shifting skills more than anything. On the road the ride is surprisingly smooth and the only exterior noise comes from a nice sounding rumble from the engine under aggressive acceleration. The one thing that stood out with us during the week is how much more attention must be paid to the drive when it is you who are responsible for the shifting. Your attention, especially in heavy traffic, has to be on gear selection, and thus the drive itself. You feel more connected to the road, and seem to enjoy the drive just that much more. Driving is becoming a lost art in many ways. Soon we all might be driven around by Google and the like and never even touch the steering wheel. And to many of us that will be a shame. Because there is something to be said about simply driving. Not checking social media, or communicating via texts, but simply driving. 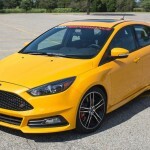 Driving the new Ford Focus ST is one great way to ensure that driving doesn’t become a lost art and remains with us for a little while longer at least. #Touche’ Ford.